On Wednesday November 28, Georgia Tech announced that eleven-year head coach Paul Johnson will retire following the team’s bowl game. The 61-year old Johnson is the 4th winningest coach among active FBS coaches, with a 189-98 record over 22 seasons as a head coach and an 82-59 record with Tech. Johnson coached the Yellow Jackets to four ACC Championship appearances, one ACC Championship title, and nine bowl game appearances, including two to the prestigious Orange Bowl. 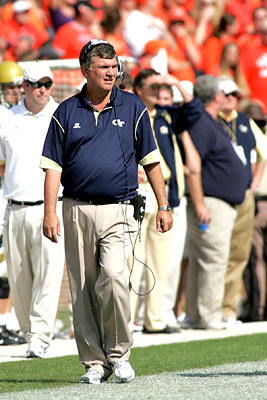 Under Johnson, the Jackets finished first or second in the ACC Coastal Division in seven of his eleven seasons. Johnson’s unique triple-option offense has defined Georgia Tech football for the last eleven years. Tech is #1 in rushing yards per game this season and has been in the top 10 in total rushing yards for ten out of Johnson’s eleven seasons. Johnson has coached for 40 years with head coaching tenures for Georgia Southern (62-10), Navy (45-29), and Georgia Tech (82-59). According to ESPN, the top candidates to be Johnson’s replacement are Georgia Tech alum and current Los Angeles Chargers offensive coordinator Ken Whisenhunt, Clemson co-offensive coordinator Tony Elliott, Georgia Tech alum and current Alabama offensive line coach Brent Key, and Army head coach Jeff Monken.